Mimoco is back, and it’s once again expanding its line of specialty USB flash drives; this time everything is focused on Star Trek. Now, Star Trek has its set of extremely loyal fans, so releasing a Star Trek line of novelty USB flash drives was a no-brainer for Mimoco. The company realized this with a line of four unique USB flash drives, each one replicating one of the main characters in Star Trek: The Original Series. The MIMOBOTs Mimoco released at the time were Mr. Spock, Captain Kirk, Captain Picard, and Data. Star Trek fans may have already noticed that another icon is missing from that lineup: George Takei’s character Mr. Sulu. Fortunately for Mr. Sulu fans, Mimoco has finally released a USB flash drive catering to their fandom needs. 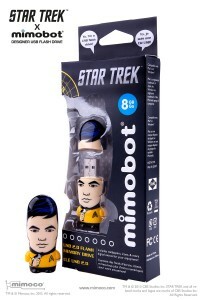 Mimoco proudly presents the Mr. Sulu MIMOBOT in tribute to George Takei and Star Trek. Mimoco’s Mr. Sulu MIMOBOT takes fans back to the series that they’ve enjoyed over the years. MIMOBOT Mr. Sulu is dressed just like George Takei’s was in the original Star Trek series, in a gold Enterprise command uniform. As a USB flash drive, Mr. Sulu may no longer be able to maneuver through the ranks of Starfleet, but he sure comes in handy for storing important data. The Mr. Sulu MIMOBOT comes in six different storage capacities, giving you the option to use the best capacity for your needs. The capacities are 8 GB, 16 GB, 32 GB USB 2.0, 32 GB USB 3.0, 64 GB, and 128 GB. To add to the potential excitement, Mr. Sulu comes loaded with goodies for his fans. The MIMOBOT USB flash drive contains wallpapers, icons, and avatars from the MimoDesk personalization suite. And just like other MIMOBOTs, Mr. Sulu comes with his very own MimoByte sound software, which plays memorable character lines each time the user plugs in or ejects the USB from a desktop or laptop. The Mimoco Mr. Sulu MIMOBOT is compatible with both Windows and Mac operating systems. It measures 2.5 x 1 in and comes with a replaceable cap that’s painted as part of Mr. Sulu’s head. Mimoco bundles the MIMOBOT with a one-year limited warranty in case of possible factory defects. If you’re a big fan, it pays to get your hands on these flash drives as soon as you can. The Mr. Sulu MIMOBOT is a limited edition piece, with only 1,000 hand-numbered pieces manufactured total. It can be bought on Mimoco’s website for prices ranging from $24.95 to $129.99. 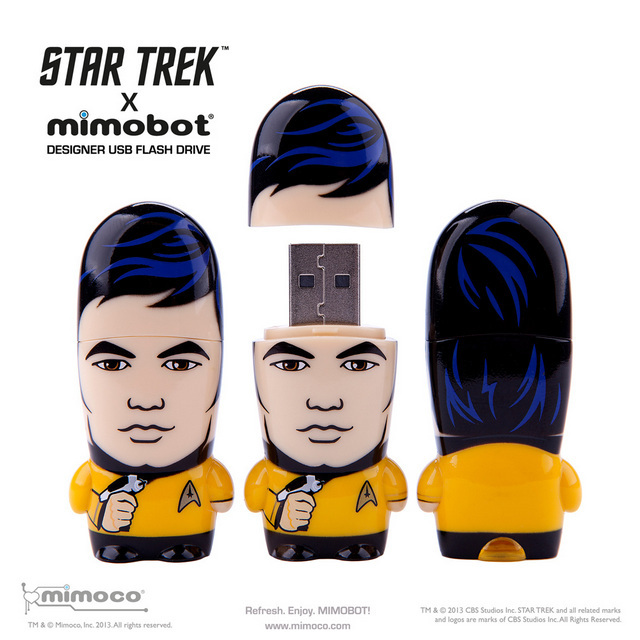 This entry was posted in Mimoco and tagged custom shaped usb drive, george takei, MIMOBOT, Mimoco, mr sulu, star trek, USB drive, USB Flash Drive. Bookmark the permalink.